We have been approached by the Shree Mahendrodaya Secondary School in the Gajuri district. This, though only 40 miles from Kathmandu, is in a most inaccessible place up in the hills. We have been asked to help to provide water facilities here and , even more ambitiously , to help with the building of a hostel. The children come from miles around the school, walking along narrow rough tracks; a scattered community over very steep hills. This school is very near the epicentre of Saturday's earthquake. 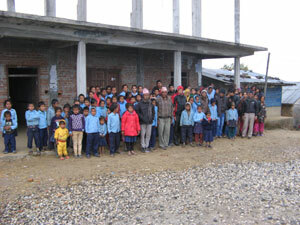 We have helped two schools in the Mahottari District near Janakpur. We started with the Junior School at Dhanusha where the headmaster had founded the school in the early 1990's with nothing more than a field and a tree. Then we added the Junior Secondary School at Ramnager to our list. To both schools we have provided materials that have been collected in the U.K.. We purchased whiteboards for all the classrooms in both schools. The short video below shows the delivery of the whiteboards. 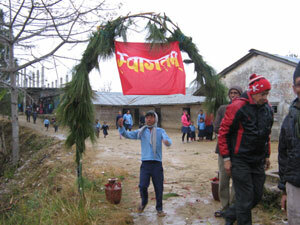 In addition a school in South London donated a day when Year 9 students prepared materials for the school at Ramnager. We plan to continue with the support we are giving. We have a volunteer who has offered to help the schools provide a more active experience for the students and to provide some supplementary education.